When you think of cooling your home, you more than likely think about your thermostat, vents, and outdoor unit. However, many other elements create and move cooled air into your home, and cooled air is not the only element that is moving through your duct work. Dirt, dust, hair, mold spores, and other allergens may also flow out through your vents and into your home. Filters trap these harmful particles and prevent them from affecting your home’s indoor air quality which is why they can quickly clog up. Most experts recommend changing your filters every three months, but certain factors may require you to replace your filters more frequently. This guide and your contractor will help you determine if you need to replace your AC filters more frequently. The number of people in your home may affect how dirty your air filters get. If you live alone, you will not need to replace your AC filter as much as someone with a larger household with multiple family members. The more people in your home, the more movement occurs, which can stir up particles. Similarly, the more people in your home, the more dead skin cells and hair circulate in the air. You should also be aware that if you have pets, you will need to replace your AC filters more frequently. Pets add hair and dander to the air, and, they also bring more dirt and dust from the outdoors, affecting air quality even further. Allergies are the sixth leading cause of chronic illness, affecting an estimated 24 million people in the United States. If you or another member of the family has allergies or experiences allergy symptoms regularly, you need to replace your AC filters more frequently. If you or another member of the family is living with one or more of the above symptoms, check your AC filters to determine if they are clogged with debris. Prescription medications can ease your allergy symptoms, but maintaining clean filters is also helpful because it will help improve your home’s indoor air quality. Understanding the Minimum Efficiency Reporting Value, or MERV, will help you determine when you should change your filter. Each type of filter is given a MERV rating. Ratings range from 1 to 20. The higher the MERV, the better the filter is at trapping dirt, dust, and other particles. A filter with a higher MERV is beneficial for your air quality, however, you should be prepared to replace the filter more frequently than if you have a filter with a lower efficiency rating. A HEPA filter, for example, may have a MERV rating between 17 and 20, helping to catch 99.97 percent of particles from the air. Because HEPA filters are so efficient and capable of trapping even the smallest of particles, they will clog up with dirt, dust, and other debris quickly. Understand the importance of your AC system’s filters if you want to cool your home efficiently. 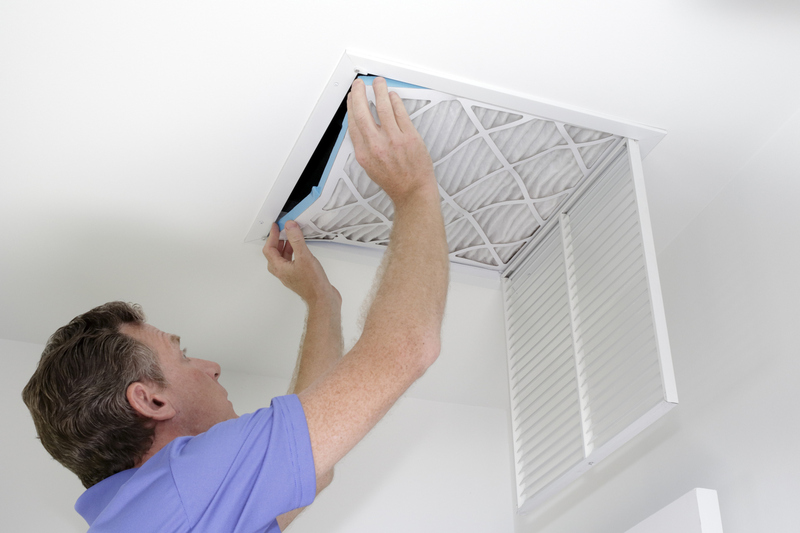 Replacing your filters as recommended to help you maintain healthy air inside the home, which will benefit your family’s health and wellness. For more information on replacing your system’s filters or if you think there is something affecting your HVAC unit that doesn’t involve the air filters, feel free to contact Mauzy Heating Air & Solar and speak with an HVAC expert today.